It is now undeniable: Winter is Coming. Which means…it’s time for some new socks! I love socks. Man, I love ’em. They’re cozy, they’re comfy and they are usually so much more fun/funny than any other article of clothing available for women. It’s like getting to shop at CrewCuts again, instead of J. Crew. Rather than the subdued greys and pleated skirts, you get pom poms! And pink! And bedazzled t-shirts! So many rhinestones. My favorite company for humorous socks is Blue Q. I first encountered this brand a few months back, while trying to find a funny birthday gift for a fellow, sock-loving filly. Take a look at the website! 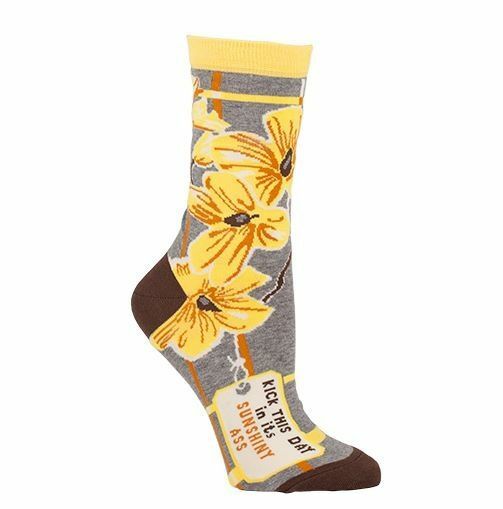 They’re whimsical and bright, with funny sayings: http://www.blueq.com/ankle/ I’m wearing mine now, and I feel so secretly sassy underneath my shoes!